Home Hotels New South Wales Mercure Sydney Nautilus Resort Queensland Binna Burra Lodge Kondari Resort Lady Elliot Rydges Capricorn Daydream Island Castaways Rydges Reef Resort Palm Royale Red Centre The Lost Camel Kings Canyon Resort Red Centre resort Glen Helen Homestead Territory Inn Tasmania The Lodge on Elisabeth Top End El Dorado Motor Inn Mercure Inn Katherine Gagudju Lodge Cooinda Kakadu resort Frontier Darwin Victoria Bothfeet Lodge Batmans Hill When conducting a websearch many Australian hotels are difficult to find. All the business seems to be in fluctation and they keep changing owners and names as well. That's normal. But the Frontier Hotel in Darwin hits the top: It seems they change their name after each 6 months. 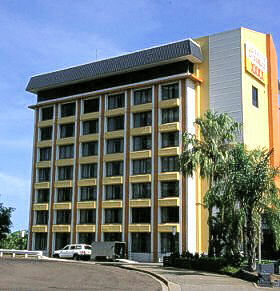 Today (February 2003) it's the "Aurora Frontier Hotel Darwin" already different from last November. But as "Frontier" seems to remain in the name, you may be able to find it anyway. In the botanical garden right behind the hotel I photographed a frilled lizard, a rare chance for tourists.